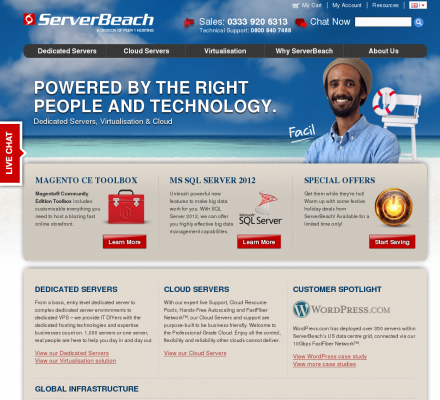 ServerBeach delivers powerful dedicated servers, convenient server management tools, and 24x7x365 LifeGuard Support™ all on our rock-solid IT infrastructure and FastFiber Network™ backbone. And while providing that sort of service, support and IT is a lot of responsibility, we make sure we never lose sight of that ‘beach’ mentality: We paddle out every day onto the big ocean of technology backed with years of experience, respect for its power, and always remembering to have fun. Nowhere else but at ServerBeach will you find this kind of serious brain (and technology) power with such a stress-free attitude. Description: At ServerBeach we promise to provide our customers with the absolute best service, performance and reliability on dedicated servers and virtualisation.